In Seal Script, 那 is the combination of 冄 (rǎn, whiskers) and 邑(yì, town; city), referring to foreigners with long beards and hair who lived west of ancient china. Later 冄邑came to mean "that", and was simplified to 那. 阝 (yì) appears on the right, it means "town" or "city", derived from the character 邑. When 阝 appears on the left, it signifies "mound" or "plenty", derived from the character 阜 (fù, mound; plenty), such as 郊 (jiāo, suburbs), or 陡 (dōu, steep). 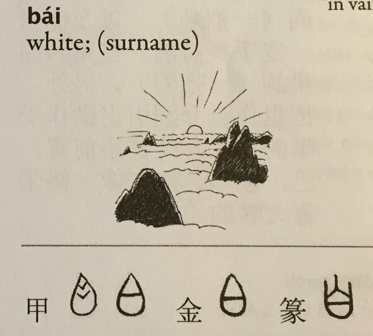 The character 的consists of 白 (bái, white) and the phonetic component 勺 (sháo, ladle; spoon). In original meaning was "bright-colored" or "distinctive" Now 的 is used to connect an attributive to a noun. 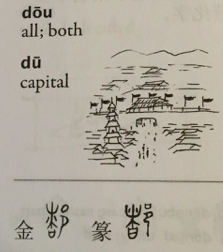 Both 白 and 勺 are pictographs. In its ancient form, 白 may resemble the bright rays spreading from the sun or a grain of white rice-- scholars differ on the explanation. 勺 is the outline of a ladle containing something. The character 照 consists of the signifying parts 日 (rì, sun) and 灬(huǒ, fire radical), and the phonetic element 召 (zhào, call), meaning "shine", "illuminate", "reflect", etc. The character 召 combines 口 (kǒu, mouth) and the phonetic component 刀 (dāo, knife), meaning "to call" and "to summon". In Seal Script, 片 stands for the right part of 木 (mù, wood), signifying the act of splitting wood into pieces and meaning "wood chip". The combined meaning of 片 include "a flat and thin piece", "a slice", "partial", "incomplete", and "one-sided". It is also a measure word for films, slices, tablets, tracts of land, etc. Pictophonetic Character. 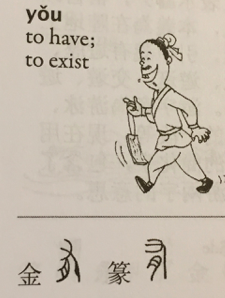 The character 這 is a combination of the walk radical 辶 (chuò), and 言 (yán, word; to speak), indicating the action of walking somewhere to speak. 這 originally meant to "go to certain place", "meet and welcome with words", and came to mean "here" and "this". The walk radical 辶 is often used in characters pertaining to movement with the feet, e.g., 進/进 (jìn, enter), 過/过(guò, pass), and 逛 (guàng, scroll). In the simplified character 這/这， 文 replaces 言. The character 爸 is made up of the radical 父 (fù, father) and the phonetic 巴 (bā, cling to). In its ancient form, 父delineats a hand holding a stone ax－ an important tool and weapon in primitive society. In Seal Script 巴 looks like a snake with a large mouth. The character 媽 is composed of 女 (nǚ, female) and 馬 (mǎ, horse). 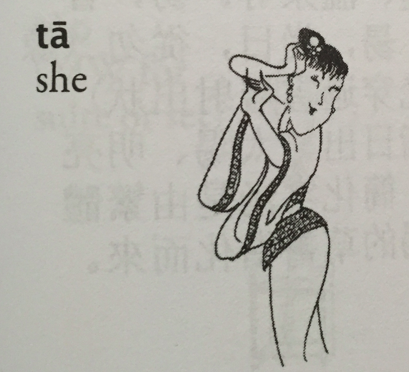 女 shows that the character's meaning relates to some female and 馬 indicates the pronunciation. 媽 does not mean female horse, though! In the simplified character 妈， 马 derives from the cursive form of 马.
Pictophonetic Character 個 consists of the person radical亻and the phonetic element 固 (gù, solid; consolidate). 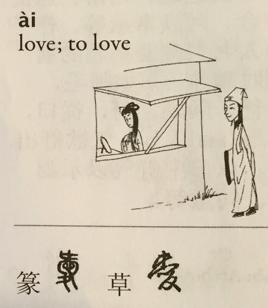 個 is a common measure word for people and other nouns. 固 has 囗 (wéi, enclose) outside and 古 (gǔ, ancient) inside, indicating an invincible city. 古 is the combination of 十 (shí, ten) and 口 (kǒu, mouth), suggesting the way in which ancient stories are passed down orally. Thus means 古 “ancient.” Many complex Chinese characters are combinations of a few simple characters, so you can learn several character at once. 個 was originally written as 个, and the simplified character restores this original form. 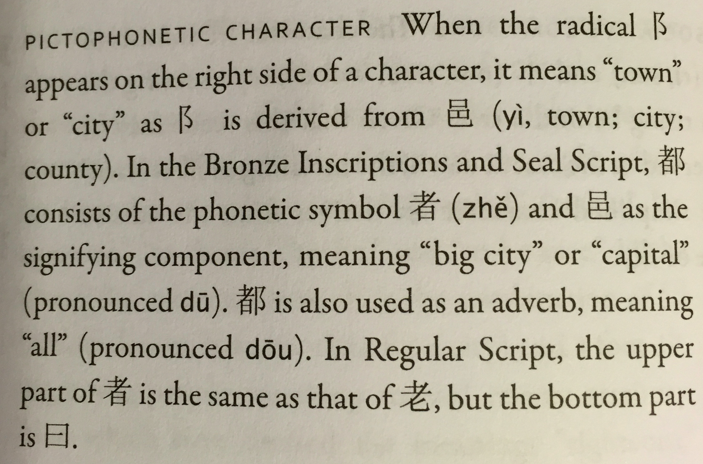 ​Pictophonetic character 孩 consists of the radical 子 (zǐ, child; son) and the phonetic symbol 亥 (hài, cut.) Its original meaning was children's laughter. Later it came to simply mean "child". in the Oracle-Bone and Bronze inscriptions, 亥 is a pictograph of a pig without a head and feet, meaning "to cut." In Regular Script, the character 亥 still resembles a pig, but one with its head on the top and two legs and a tail as the lower part. ​Pictophonetic Character The character 誰 is the combination of 言 the word speech radical and the phonetic element 隹 (zhuī, short-tailed bird.) 誰 does not mean the speech of a bird, but the personal interrogative pronoun "who". In the simplified character 谁, the speech radical is simplified. ​Pictophonetic character 她 consists of the female radical 女 and the phonetic component 也 (yě, also.) It is used as the third person pronoun for females. 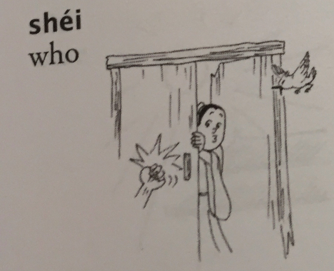 Both 他 (tā, he) and 她 (tā, she) have the component 也 in the right part, but the character 他 has the person radical亻while 她 has the female radical 女. 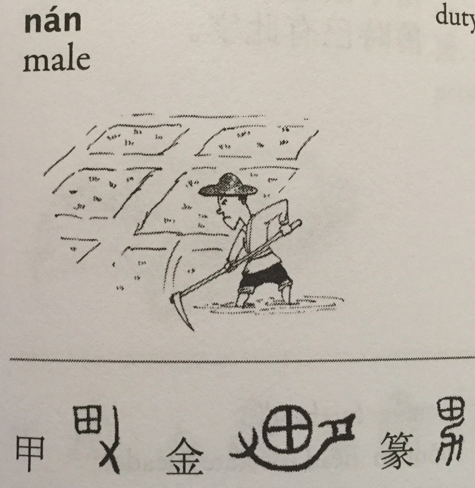 ​Associative compound The character 男 consists of 田 (tián, field) and 力 (lì, plow; physical strength or power.) In ancient agricultural societies, men provided most of the manpower in the fields, and it was the men's duty to plow the fields. 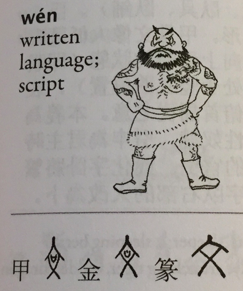 ​Associative compound In its ancient form, the character 弟 looks like a man with a bow on his shoulder. 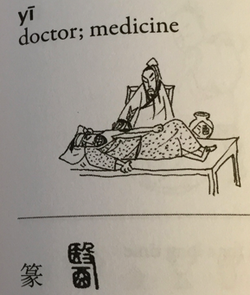 Some scholars believe the character 弟 refers to a cord wound around something. The original meaning of was "order" and it came to mean "younger brother." In Regular Script, we can still see the bow 弓 (gōng) in the character 弟. Other than the bow, the top part of 弟 looks like a child's hair twisted in two knots and the lower part the two legs. ​Pictophonetic Character 他 is built with person radical亻and the phonetic component 也 (yě, also.) 他 is a variant form of亻它. It originally meant "other" and is used today as the third person pronoun for males. In the Bronze Inscriptions and Seal Script, 也 looks like a snake with a large head, and its original meaning was "snake." Later 也 was borrowed to mean "also" or "too." ​Associative compound In the Oracle-Bone Inscriptions, 可(kě) resembles a mouth exhaling, and meant "approve" or "okay." The character 哥 consists of 可 two characters, one on the top of the other, showing someone opening his or her mouth to sing. 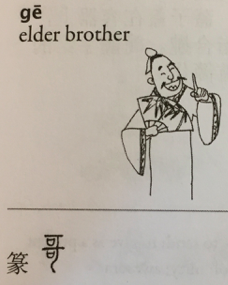 Therefore, the original meaning of 哥 was "to sing," but later came to mean "elder brother." For the word "sing," 欠(qiàn, yawn, breathe) is added to the right part of 哥 (歌gē, sing.) Does anyone have a big brother who always opens his big mouth to sing? ​Pictograph In its ancient form, 兒 looks like a baby whose skull has not finished forming. 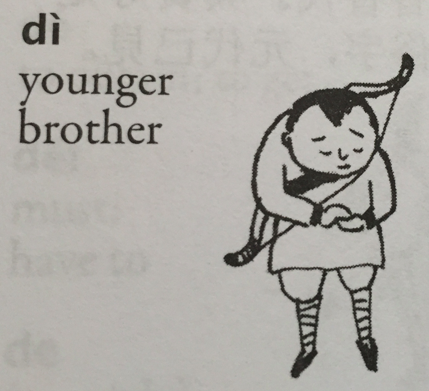 兒 means "small child" and "son." In Regular Script, 兒 resembles a baby with a big head and two thin legs. The simplifies form of the character (儿) uses only the bottom part of traditional form (兒). Associative Compound In Seal Script, 沒 consists of a circle of whirlpool回 on top, and a right hand 又 at the bottom, indicating a person sinking in a whirlpool with one hand sticking out. 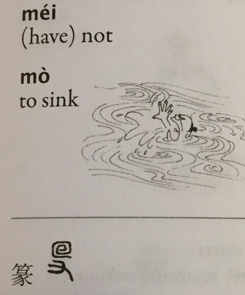 It makes sense that the original meaning of 沒 was "to sink" or "disappear" (pronounced mò.) Current meanings include "disappear," "end," and "to not have." In Regular Script, a water radical氵is added to the left of the character and the component 回 on the top has been simplified to 儿or勹. The simplified form is 沒. 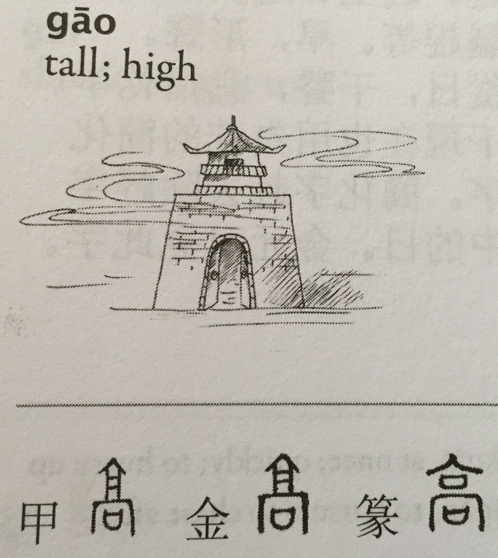 ​Pictograph In the Oracle-Bone and Bronze Inscriptions, the character 高 looks like a tall building with a tower above and walls with a gate underneath, conveying the meanings "tall," "high," and "above average." When you memorize the character, try to imagine a two-story building with a gate on each level. Don't forget the tower on top! ​Pictograph In the Oracle-Bone and Bronze Inscriptions, the character 文 shows a man with a tattoo on his chest. The original meaning of 文 was "tattoo" or "pattern." Later it came to mean "script," "language," "writing," "culture," "literacy," etc. in Regular Script, the character 文 still looks like a man with a broad chest but without a tattoo. Associative Compound In the Oracle-Bone and Bronze Inscriptions, the character 家 consists of the roof radical on top and a pig 豕underneath. In China's ancient agricultural society, a household without pigs or other livestock would be considered poor. In its ancient forms, 豕is the pictograph of a pig with a head, rounded body, legs, and a short tail. Notice the differences between 豕and 亥 (hài), a pig without head and feet. ​Associative Compound The character 幾 consists of two wisps of silk 幺幺 (yāo, tiny; small) on top, and a person with a dagger-axe 戍 (shù, guard; defend) at the bottom. Originally 幾 meant signs of danger to guard against. 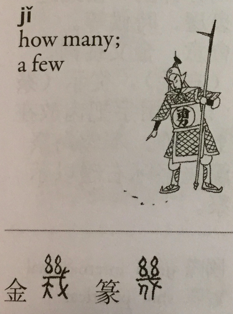 Later it came to mean "few" or "how many." Whether used in a statement or a question, 幾 refers only to a small number (between one and nine). 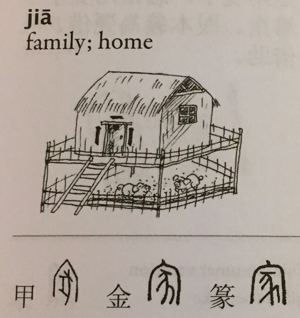 Originally the character 几 (jī) meant a small table. in simplified characters, 几 is used to replace 幾 and means "how many" or "a few" because the pronunciations are very similar. ​Associative Compound In the Bronze Inscriptions. 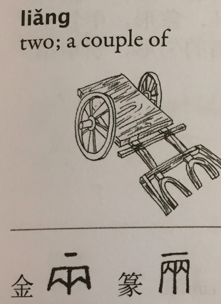 the character 兩 resembles a chariot with two yokes, meaning "a couple" or "two." In Regular Script, 兩 retains the same basic structures as that of the Bronze Inscriptions form. In the simplified character 兩, the inside is composed of two 人, differing slightly from the tradition character 兩. ​Pictophonetic character The character 妹 is made up of the female radical 女 and the phonetic element 未 (wèi, future). In its ancient form, 未 is a pictograph of a tree with many leaves. (Compare 未 with 木 mù, wood; tree.) 未 originally mean "luxuriant," and later came to mean "future." 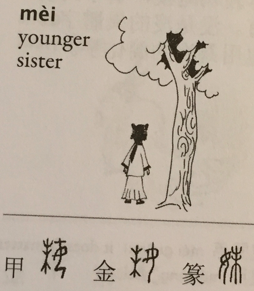 "Younger sister," therefore, is a young girls with bounteous future. ​Pictophonetic character 和 is a simplification of the character 龢. 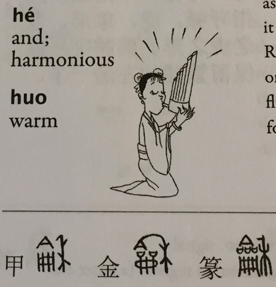 In its ancient form, 龢 has 龠 (yuè, the pictograph of a flute-like instrument) as a the signifying component and 禾 (hé, a pictograph of a ripe rice plant) as the phonetic symbol, meaning "harmonious." Today is also means "echo," "and," "peace," "mild," etc. 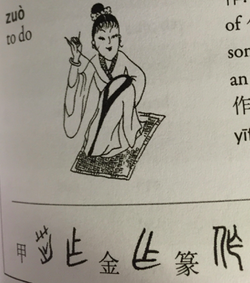 In Regular Script, 龠 is replaced by 口 (kǒu, mouth) since one uses one's mouth to play wind instruments (like flutes). 禾 remains part of the character today, but its found on the left side instead of the right. ​Associative Compound In the Oracle-Bone and Bronze Inscriptions, the character 作 is written as 乍 (zhà). 乍 looks like the stitching of a collar, and its original meaning was therefore "to do" or "to make." In Seal Script, the person radical亻 is added to 乍 to form 作. 做 developed later than 作, and is the combination of 亻and 故 (gù, former). When 作 is used as a verb, sometimes is interchangeable with 做. 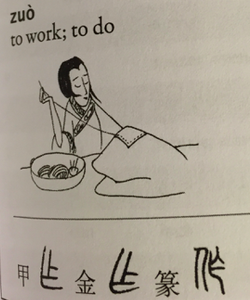 However, if an action involved body movement, 做 is preferable to , such as in 做飯 (zuòfàn, to cook) and 做衣服 (zuò yīfu, to make clothes). Associative and Pictophontic Compound In the Oracle-Bone and Bronze Inscriptions, the character 作 represents stitching a collar, therefore meaning “to do” or “to make” something. In Seal Script, the person radical 亻 was added to the left of to form作。作also appears in the characters 怎(zěn how) and 昨(zuó yesterday). When作 is used as a verb, sometimes it can be replaced by 做, a character which was developed later. However, in certain combinations, such as 工作，做, cannot be substituted for作. Pictophonetic Character The character律combines the radical (left step; walk slowly) with 聿(yù pen; then) and the phonetic symbol, meaning “rule” or “law.” In the Oracle-Bone and Bronze inscriptions, shows a hand holding a brush. 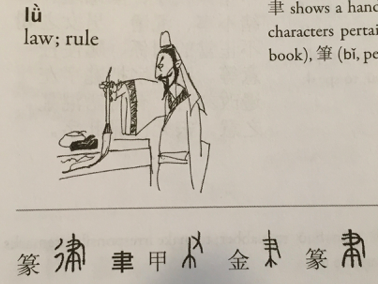 聿is often used in characters pertaining to brushwork, such as 書(shū book) (bǐpen) and 畫(huà painting). 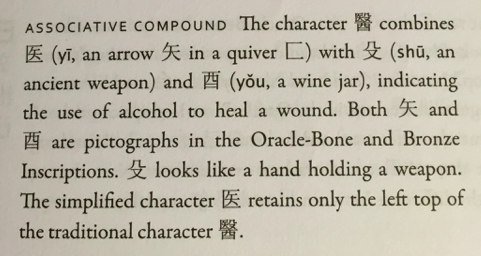 Associative Compound the character 醫combines医(yī an arrow in a quiver) with 殳(shū an ancient weapon) and 酉(yǒu wine jar), indicating the use of alcohol to heal a wound. 酉is a pictograph in the Oracle-Bone and Bronze Inscriptions. 殳look like a hand holding a weapon. The simplified character retains only the left top of the traditional character醫. Pictograph 英is the combination of the grass radical 艹 and the phonetic 央(yāng). 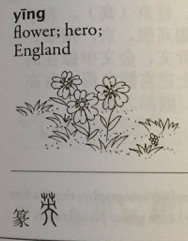 It's original meaning was “flower” and extended meanings include “hero” and “outstanding.” Additionally, in Chinese “England” is translated as 英国 (yīngguó) based on its English pronunciation. The grass radical derives from the character 艸(cǎo grass). In the Oracle-Bone Inscriptions, 央looks like a figure carrying something on a shoulder pole. Since the figure stands in the middle, 央means “middle” or “center.” In Regular Script, 央resembles a figure from the front (dà,大) with something on its shoulders.